Thom Conboy at Merle Wood & Associates calls me with the excellent news that he acted for the seller in today's sale of Heesen's 46.7m motor yacht Blind Date, with Burgess representing the buyer in the 200th superyacht sale so far in 2011. Launched in September 2009, Blind Date is one of the most impressive yachts to leave the Heesen yard. Exterior design is by Heesen and Omega Architects with an interior by English designers, Keech Green working closely with the owner. 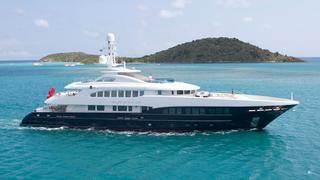 Accommodating 10 guests in a master suite, three double staterooms and a twin cabin, Blind Date was asking €26.9 million.